The How to Submit Tab contains individual sub-pages describing, in detail, the logistics and requirements for each type of IRB submission. Please select the type of application you would like to submit from the tab menu and review the instructions and download associated forms prior to creating your submission in HSERA.. Please note that submitting to the Penn IRB requires regular utilization of this website in conjuction with using the Human Subjects Research Electronic Application (HSERA) system. Please see below for general information about submitting to the IRB that is not specific to a particular submission type. In the Spring of 2016 the IRB changed the submission process and released new forms for each type of submission for approved research. These changes did NOT affect the process for initial review.The new forms for Continuing Review, Modification, Deviation, Exception request and Closure, became available for download in March 2016. Additional guidance for each type of submission has been published in the follwing “How to Submit” pages that are dedicated to each submission type. This new process will require that all approved studies use the new forms regardless of whether they are tracked in HSERA or have a paper file with the IRB. Please note that the Initial application for starting a new study did not change with the release of the new forms. The new process only applies to Continuing Review, Modification, Deviations, Exception Requests, & Reportable Event submissions. When Should I start using the new forms? The new forms became available for download in March 2016 and are required for all submissions after June 1, 2016. Any submissions recieved that do not utilize the new forms are subject to return by the IRB staff prior to review. These studies will continue to complete the Word.doc formatted submission forms as usual and submit paper printed copies of all documents to the IRB office. The only thing that has changed about this process is the IRB forms themselves. HSERA will be changing over time but what the final product will look like is still in production. In order to have a plan in place while these changes are developed and tested, the IRB is asking that study teams complete the new Word.doc forms for each submission and upload them as attachments to the corresponding HSERA submission in lieu of completing the old questions that are programmed into HSERA. For any required field on page 1 of HSERA, just type "See attached form" or "NA" or"0"in order to move through the application smoothly. As long as the attached form is filled out compeltely the IRB will not raise issue with the HSERA fields being "blank". The reason for this is related to the planned removal of most of the HSERA form fields. Starting in May 2017 All IRB submissions for Greater Than Minimal Risk research must include a complete list of documents being submitted for review as they should appear in your determination letter (document name, version #, date).The IRB will not add a document list to any determination letters for Minimal Risk or Exempt research unless specifically requested and provided by the study team. Starting in June 2016 All submissions for approved research (Modification, Continuing Review, Deviation, Exception, Reportable Event) must include a completed copy of the corresponding submission form. The forms are available on the "Forms and Templates" page of this website. 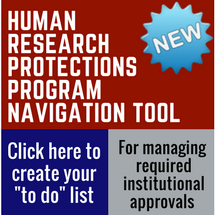 The University of Pennsylvania has a complex collaboritve program for ensuring research compliance and protecting human research subjects. IRB review and approval is just one of many approvals that may be needed to begin a new study. The IRB has developed a tool that will allow you to create a "To Do List" regarding necessary ancillary approvals based on the design of your study. With the information obtained here you may work with these other groups while simultaneously obtaining IRB approval instead of waiting for the IRB to stipulate various additional approvals.